A few years ago, one of my first cousins on my father’s side of the family informed me that she’d found a book that my father had given his mother back in the 70’s. 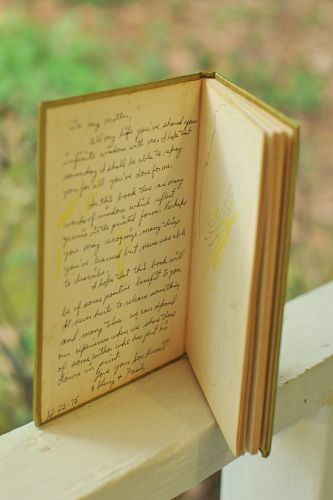 She asked if I would like to have it and that my father wrote a personalized note in the front cover. Not really knowing what the book was about nor its history, I gladly accepted her offer to send it to me. What arrived was so much more than I anticipated. Both my father and paternal grandmother passed away many years ago, and this gift that was given to TaLa (my grandmother) has now become a gift to me 40 years later. What a treasure. Upon receipt of the book, I was stunned to see my father’s handwritten note on the opening cover. The date at the bottom is 1975 – a few years before I was born. At the time of this gift, he was attending law school and he and my mother were living on a meager income with 2 children while he invested in educating himself so he could provide better for his growing family. I pick up the book whenever I need a message of hope or inspiration. The book is organized in chapters according to themes: Love, Joy, Peace, Long Suffering, Gentleness, Goodness, Faith, Meekness, Temperance – all taken from an excerpt of Galatians 5:22-23. Many of the quotes are so simple in concept, but demonstrate incredible wisdom. After receiving the book, I spoke to my mother about how I loved this treasure from my family’s past and she remembered the Christmas gift from so many years ago. She also had a copy of the same book that my father bought her at the same time, but her copy had been misplaced. Amazon saved the day – I bought her another copy, which she now treasures. 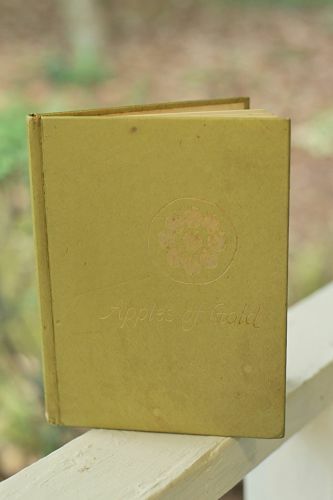 The book has been loved and it shows – I cleaned it up with the help of a Magic Eraser and it’s almost good as new. I really should sew up a fabric book cover for this treasure with a ribbon bookmark so I can easily find my favorite quotes. In the coming weeks, I’ll share some of my favorite quotes from the book on my social media accounts, be sure to follow me on Instagram, Twitter and Facebook so you can share in the incredible wisdom of this priceless gift.